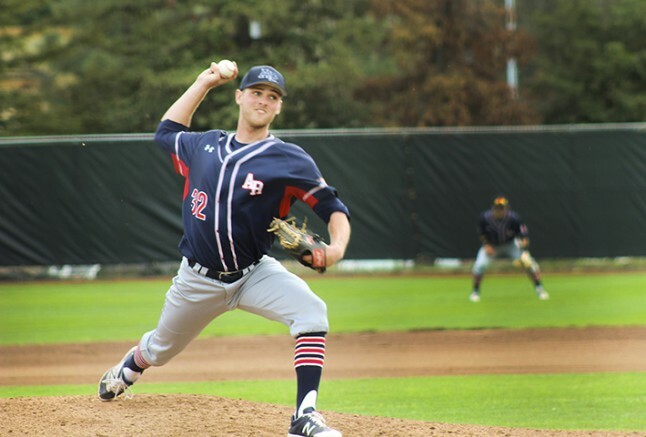 American River College’s baseball team started off March with a strong win against Sierra College 8-4, but both players and coaches still think there are some areas that can be improved on before going into conference. ARC started off with a good defense, forcing Sierra to have a three up three down at bat in the bottom of the first. ARC was quick to get points on the board when third baseman Brayden Gomez ran in from second with a go ahead shot from catcher Matt Elliot in the top of the second to make it a 1-0 game. ARC wasn’t keeping Sierra’s bats quiet, but the Beavers defense was able to make some good plays that kept Sierra scoreless. Sierra was able to get a run in the bottom of the third, but ARC opening pitcher Micah Gunter knocked out the next batter to close out the inning. Gunter was pulled at the bottom of the fourth and Tommy Balmain was put in. Sierra was able to get some hits that panel, but ARC’s defense was on it and caught out all three outs. “We did good, there are definitely some spots we can always improve on, but we made more things happen then they did and that’s what it comes down to at the end of the day,” said outfielder Cade Parker. Defense wasn’t the only game winning factor for ARC — at the bottom of the fifth the bats really came alive for ARC. Gomez came up to bat with bases loaded and cranked one out to deep center to bring in two runs and make it 3-1 ARC. The Beavers weren’t done scoring yet, as shortstop Mike Hatfield and infielder Tyler Swank brought in two more runs to make it a 5-1 game. Throughout the next two innings, both teams played solid defense and kept it scoreless. ARC started back up on their scoring campaign towards the end of the of the seventh, when Swank once again brought in two more runs, giving ARC a 7-1 lead. Swank was then brought in for his third run of the game giving ARC a 8-1 lead. ARC’s pitching and defense did show some signs of fatigue in the final innings, allowing Sierra to bring in three more runs. “Pitch execution is something I believe could be better,” said pitcher Tommy Balmain. Tyler McCombs was pulled off the mound with only one out left in the bottom of the ninth and closing pitcher Ian Codina finished the job. Codina walked one and struck out the second to make it a 8-4 final ARC. ARC, now having a 6-9 record, will have its conference season opener against 12-1 Cosumnes River College on March 10. Be the first to comment on "ARC baseball pulls a Big 8 win against Sierra"